Lt. Colonel John Paul Vann is the central figure in this adaptation of Neil Sheehan’s book chronicling the Vietnam War from the beginnings of US escalation through the major withdrawal of US ground forces in 1972. 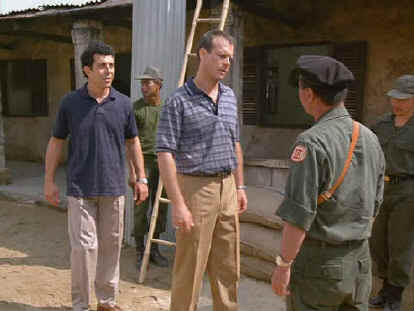 Played by the likable Bill Paxton, Vann’s character almost mimics the character of the American involvement in South Vietnam. Vann’s point of view is never anything but selfish and even in those scenes when he attempts to help the Vietnamese people, his motivation remains suspect. Vann is portrayed as a tough military realist. Through his eyes we watch the blunders of the American military command during a ten-year period as the Vietnam situation erodes to the point of no return. For those who have experienced the Vietnam War, A Bright Shining Light is a different view than most were exposed to. Though there are scenes in the field, this is the tale of the board room boys, running a war to satisfy themselves. And it’s the saga of the failure of the South Vietnamese Army. Director Terry George provides plenty of explosions, some of them displayed with a perverse visual splendor. The cutting is not imaginative and the long period of the story leaves some large gaps in the flow of A Bright Shining Light. Still, the power of the message is frightening. I think the characterization of Vann’s first Vietnamese girl friend Lee is the most important in the film. She stands in for South Vietnam, and if you equate Vann with the US, the way he uses and eventually abandons her parallels the strange relationship of America and Vietnam. Filmed by HBO as a special for cable, A Bright Shining Lie achieves a great deal with limited resources n compared to the typical Hollywood project. The DVD is presented in 1.33 aspect ratio and the compositions are executed with care. There is some undue grain in the transfer, but overall the DVD is clean and free of artifacts. Color accuracy is excellent. The DVD is delivered with excellent contrast. Detail is fine with little enhancement noticeable. The Dolby Digital 2 channel sound is presented with a good field. Explosive impact is adequate.